Zero TR – X01 Eagle 12 speed | Bird MTB – Born in Swinley, Built in the UK. The Zero TR X01 Eagle is our highest specification trail hardtail. Featuring Rockshox 130mm forks and SRAM X01 Eagle 12 speed drivetrain. This table is for guidance and is based around a 50mm stem. Larger or Smaller frames can be suitable depending on stem length and riding style. If in doubt, a good guide is to find the ETT (effective top tube, or horizontal top tube) of a frame that you are comfortable riding, and add the stem length to this number (for example, 600+60 = 660). Compare this to the ETT + stem of the Bird frame that you are considering. Feel free to call us for more detailed sizing advice. With its completely new, 4-piston S4 caliper, SwingLink™ lever cam and carbon lever blade, the Guide Ultimate stands alone as the leader in its class. It has been engineered to be light and powerful, with superior heat management capabilities, which gives you better, more consistent, more reliable braking—everything you need when you’re bashing through rocks, approaching a drop, or just pointing your wheels toward destinations unknown. More adventures, fewer limitations. Follow the leader. Rear Mech, Shifter, Cranks, Cassette and Chain . NOTE: cranks will be supplied with the correct 49mm non boost cranks instead of the boost cranks shown in the groupset. The SRAM x01 Eagle drivetrain is one of a new breed of ultra lightweight, wide range 1x drivetrains that have finally killed the front derailleur for many. Featuring crisp shifting and the superb 10-50 range cassette, using the proven XD freehub system, X01 is the enduro racer's 12 speed drivetrain of choice. Truvativ Descendant Carbon DUB cranks are light and strong - possibly the best value carbon cranks anywhere! Wider than Turbine but still sporting the aggressive sweep design putting you in the perfect riding position, these bars come in a variety of rises to allow you to fine tune your cockpit and dial in your setup. Tried and tested 7075 aluminum gives you the confidence for aggressive all-mountain riding and 35mm technology for fantastic overall weight/strength ratio. Your six inch travel bike will thank you. 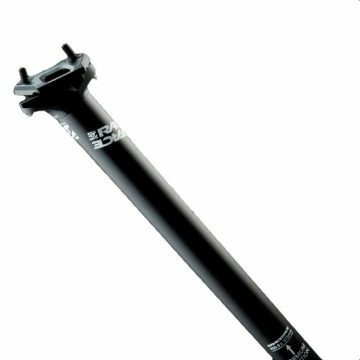 The 35mm Turbine stem is a new design that maintains the class leading stiffness & weight of the 31.8mm Turbine stem but brings the advantages of 35mm to the XC/Trail crowd. This highly engineered stem is machined from aerospace 7075 aluminum alloy, making the Turbine 35 ideal for high level cross country racers but is strong to handle all day epic trail rides.